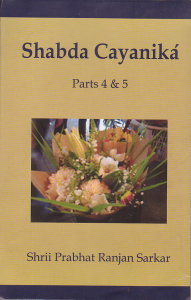 Shabda Cayanika (A collection of Words) is a study of Bengali language – its grammar and usage. Shabda Cayanika (A collection of Words) is a study of Bengali language – its grammar and usage. Once we begin reading however, we soon realize it is a philology of Bengali that becomes a fascinating journey through all the landscapes of human knowledge – history, geography, medicine, science, art, religion, and philosophy – using Bengali words as points of departure. In leading us through this linguistic adventure Shrii Sarkar shares his unique wisdom of the world in a way, that enriches our comprehension and clarifies our human heritage as never before.